“Art, music, acting, writing, combat. Rarely does a development studio nail so many elements of game design, but Supergiant Games did so with Bastion, the team’s debut title.” In High Scores Volume #2 we take a look at the beautiful tones of Bastion. High Scores is a series wherein Liam analyses/gushes about his favourite modern videogame soundtracks. His musical “qualifications” include a GCSE in Music, an A level in Music Technology and a song he wrote about that pirate lady from Dragon Age II which will never be released on the internet. Art, music, acting, writing, combat. Rarely does a development studio nail so many elements of game design, but Supergiant Games did so with Bastion, the team’s debut title. At launch, one of the game’s most lauded aspects was its sound design, namely Logan Cunningham’s gravelly narration and Darren Korb’s eclectic score. Though I thoroughly enjoyed playing Bastion – it was far and away my favourite game on XBLA – it was only when the credits rolled and “Setting Sail, Coming Home” filled my ears that I knew I had just played something truly exceptional. Bastion‘s soundtrack is one that stays with you long after you’ve put the game down, bought the CD and even learned the songs on guitar; Bastion possesses a truly High Score. Korb defines his Bastion score as “acoustic frontier hip-hop”, and while that’s a pretty accurate summation, I think it’s so much more than that. Just in terms of instrumentation, “A Proper Story” (almost) starts things off with a blend of electronic, country and Indian classical music influences. It shouldn’t work, but it all melds together in a way that feels strangely natural and unquestionably unique. 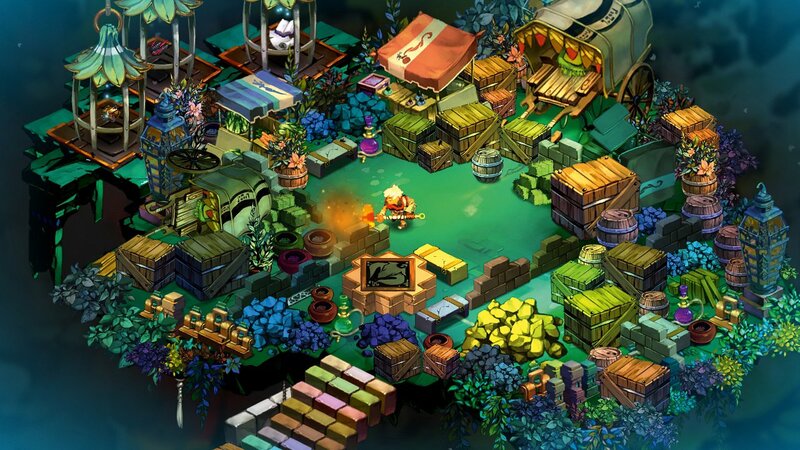 Korb’s clever use of instrumentation is evident throughout Bastion: particularly the use of acoustic guitars and strings juxtaposed against electronic drums, which echoes the old vs. new tone and aesthetic of Bastion‘s art, design and narrative. “In Case of Trouble” is the first thing you hear when you start Bastion up, and it’s probably one of the game’s most memorable tracks. It builds a sense of tension and foreboding that invites you in to the game, all the while setting the tone for things to come. Despite being an instrumental track (like the majority of Bastion‘s music), “In Case of Trouble” is an awfully catchy little number, something one could say about near enough every track on the OST. Even the more battle-y tracks possess some incredible hooks that will lodge themselves deep within your brain after one listen; the winding woodwind of “Twisted Streets” mixes brilliantly with synthesizer sounds, and the percussive, hard rock guitars of “Brusher Patrol” create the perfect musical backdrop for Bastion‘s fast-paced, reactive combat sequences.Heck, how do you even begin to describe “Terminal March“? Bangra-hip-pop? Despite sampling and arguably creating new genres and genre hybrids, Bastion‘s score functions surprisingly well as a cohesive and consistent work. Every piece either compliments or transcends the level it was assigned to, and some tracks even managed to take on a life of their own outside of simply accompanying the game. The powerful quartet of “Build That Wall“, “What’s Left Undone“, “Mother I’m Here” and “Setting Sail, Coming Home” presents four variations on the what is ostensibly the same piece of music, but each brings its own flavour to the mix. Zia’s theme feels like a more hopeful and optimistic version of Zulf’s theme, “Setting Sail” represents the teamwork and camaraderie of the game’s four principle characters during their escape, and “What’s Left Undone” is Logan Cunningham humming – ’nuff said. In this way, Korb’s soundtrack not only reflects the world, art, pace and tone of Bastion, but it also reflects and understands the motivations and attitudes of its characters. Since there is very little dialogue in the game outside of Rucks’ narration, these rare vocal treats work almost like show tunes that let the player look inside the characters of the main piece. My personal highlights from Korb’s score outside of the aforementioned quartet would have to be the meandering, Firefly-esque “Slinger’s Song” that screams “dramatic saloon entrance”, and the explosive and riff-laden “Spike On a Rail”, which sounds like it was written for/by an incarcerated hill-billy virtuoso. There are just so many great tracks to choose though, and all of them work in their own unique ways. I even used samples of “Mine, Windbag, Mine” in a short post-apocalyptic film I made for a school project a while ago, its ominous sci-fi synth sound was just too powerful to resist. It’s come to a point now where I remember Bastion‘s music more vividly than its parent game, such is the power of Korb’s score. I’ll listen to the OST from start to finish if I don’t have time to play Bastion, because the music parallels The Kid’s story so perfectly that I’ll pretty much feel like I’m back fighting in Caelondia. This piece is fairly timely (almost as if I planned it), since Supergiant’s second game, Transistor, is coming out on May 20th. From early trailers, Korb’s music appears to be just as good the second time around, and Ashley Barrett is once again lending her fantastic voice to the project, seemingly as the game’s main character “Red”. It would come as a surprise if Transistor‘s music was anything less than stellar.